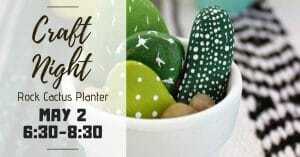 This is the last Craft Night of the season (we'll be back in November!) and we are hoping to usher in summer with these evergreen Rock Cactus Planters! Join us on Thursday, May 2nd from 6:30-8:30PM! Your $35 fee includes: -your unique craft -all the supplies needed to create the craft -instruction from Megan -2..